Luke’s missing hand is supposed to foreshadow that he is becoming more like Vader, and as the new trailer demonstrates, Luke is destined to eventually succumb to the dark side of the force. Modern prosthesis in the real world are becoming more functional, including the ability to control movement of prosthetic limbs through brainwave reading technology, and in some cases directly attaching electronics to nerve tissue. These movement-controlling features are one way, with the brain signals ordering a machine to following commands properly. Just around the corner from now, prosthesis will be able to send signals back to the brain, allowing the user to experience a sense of touch in their artificial limb. When this technology becomes available, the brain will actually be communicating with an artificial limb, an external piece of machinery that can influence the brain and create false impressions in specific areas of the mind. The Star Wars movies don’t always explain how their technology works but there is an obvious symbolic pattern. When characters in Star Wars get an artificial limb, it works better than anything we have in the real world, today. It looks like a real hand, blending seamlessly with the humanoid it’s attached to. Most importantly, it can feel, even feel pain when a robotic tool pokes his fingers to test the tactile sensitivity. 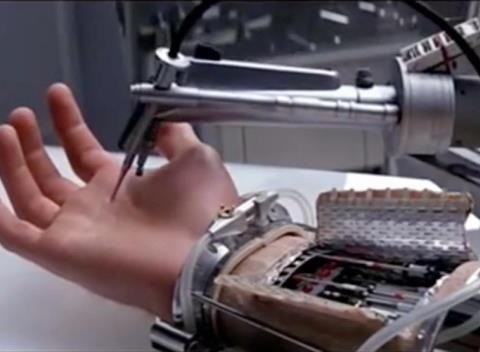 Luke’s new hand can receive signals from his brain but it can also send signals back into his brain. Symbolically, this is the beginning of Luke’s long journey to the dark side. Luke is becoming more like his father in more than one way. When this thought initially struck me, I went so far as to speculate that maybe the dark side of the force lives within the machinery, the computerized components of the Star Wars universe’s technology. There are some other examples of the light side of the force helping Luke aim photon torpedoes in order to blow up the original Death Star, which he did by specifically abandoning the computerized guidance system. The flaw in this theory is this: The Emperor is the only character who can use the dark side of the force besides Darth Vader, when the original Trilogy, A New Hope, Empire Strikes Back, and Return of the Jedi were made. The Emperor doesn’t seem to have prostheses. Back in our world it’s a dangerous precedent to associate cybernetics with evil, as workable prostheses become more likely to happen and a superstition associated with artificial limbs could become a form of bigotry against the disabled people who use prostheses. While no one wants to create a false worry, making a fully tactile prosthetic hand would actually involve manipulating the brain and indeed the mind itself.